Below is a list of dealers providing Rackham Prints & Books available for purchase. 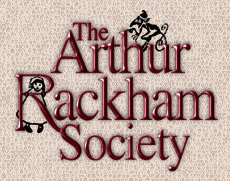 The list is divided into two sections, Dealer Members of The Arthur Rackham Society and Dealer Non-Members. If you find any discrepancies in the information provided below, or if you would like to nominate a new listing, please contact us. Children's and illustrated books for the collector. Issues periodic catalogues. See also their website for a large collection of Rackham books and original art. See their website for Rackham original art and books. Children’s and illustrated books. Query their website for Rackham books, including some with original art. They maintain a supply of original Arthur Rackham prints (no reproductions) for their customers. Contact them for a description of current offerings. Situated in the town renowned for its 30 or more bookshops, Roses’s carries a stock of over 12,000 children’s and illustrated books. Rare and out-of-print bookseller specializing in children's and illustrated books. Register for monthly newsletters and email book lists at their website. See their website for illustrated listings of their Rackham offerings. Issues periodic catalogues. Search their site for “Rackham” for a list of current offerings. Issues periodic catalogues with modern works featuring Rackham art. Hosts annual show, The Illustrators; The British Art of Illustration. Their website hosts a special section devoted to offerings of Rackham original art, past and present. Fine, rare, and unusual books from the fifteenth through the twentieth centuries. Available to meet with customers by appointment only between the hours of 9 a.m. and 5:30 p.m., Monday through Saturday. Phone or email for an appointment. Rare books; specialize in illustrated material. Query their website for Rackham books, including some with original art. Query their website for list of current Rackham offerings. Visit their Contact page for email form to contact them. See their website for Rackham original art, limited edition books (some with original watercolors), first editions, and books finely bound by the Chelsea Bindery. 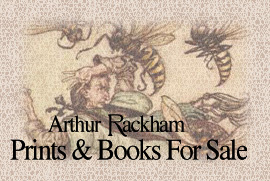 Offers a number of vintage and modern Rackham books for sale. Visit our list of Rackham web resources.